← Book Trailers: Boon or Bust? Non-fiction paranormal books are my guilty pleasure—they’re always light fare, an escape, and usually inspire a short story or two. Therefore, I look for books on paranormal subjects about which I know little or nothing; unfortunately, not knowing the material means it’s easier for me to be turned off by the sometimes seemingly-scantily researched, poorly-written or flat-out boring. 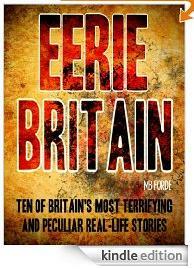 MB Forde’s Eerie Britain: Ten of Britain’s Most Terrifying and Peculiar Real-Life Stories, thankfully, fits none of these descriptions—and, in fact, I’d recommend it as the top primer to anyone unfamiliar withBritain’s scariest legends. First, the text is definitely well-researched; incidents from the past are taken from direct accounts. The writer also provides a list of recommended reading and web resources at the end of the book, so I went on to do more research on two of the book’s cases I found most fascinating. Second, the style is not only easy to read, it’s linear and gripping; each case starts at Point A and ends at Point Z, providing a clear overview of the case’s origin, its repeated occurrences, and where the theories surrounding it stand today. Third, it was thoroughly entertaining—this is not, at all, what I would call “dry”—and, in fact, there were a couple of sections which honestly gave me the chills; the descriptions are vivid enough that, at times, I felt as though I was reading a good fiction. If there were two negative things I’d say about this book, it’s that the punctuation is never inside the quotation marks, as it should be. As a writer, I was totally annoyed to the point of distraction by that. In addition, there were some poorly-constructed sentences (to the point at which I didn’t know what he was trying to say), and Chapter 5, in particular, was loaded with improper use of semi-colons and commas as well as typos. The second is that, although, as I said, I can tell it is well-researched, the citations should have been footnoted with the specifics on where to locate the original material. Despite all of that, the book is honestly a worthwhile read. It grabbed my attention and held it, and because I entered knowing nothing about any ofBritain’s paranormal legends, I got my money’s worth. Posted on May 10, 2012, in Reviews and tagged Cashen's Gap, Chambercombe Manor, Devil’s Hoof-Prints, Glydwish Wood, Hampton Court Palace ghost video, MacKenzie Poltergeist, Paranormal Investigation. Bookmark the permalink. Leave a comment.